The following children were chosen as recent Lynchburg-Clay Elementary Students of the Month. 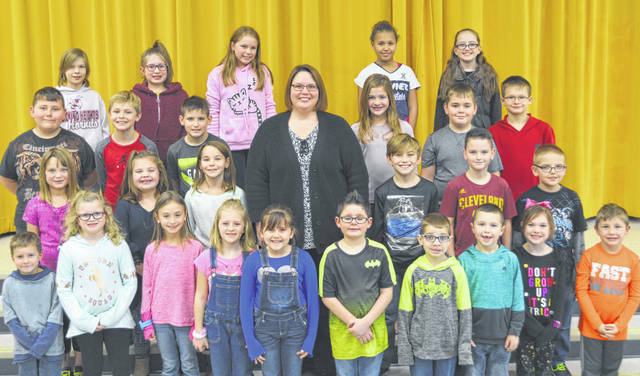 The students were chosen by their teacher for displaying positive behavior, being responsible and respectful, doing good deeds as well as their school work, and for being a positive role model for others. Pictured are: (front row, l-r) Oliver Hall (PK), Jillian Roberts (1), Kinsey Fulks (2), Kiley Hively (1), Cheyenne Casteel (1), James Smith (1), Kaden Hurley (1), Coy Rom (K), Annabelle Case (K) and Zavier Bettele (K); (second row, l-r) Mahalia Baker (2), Brynleigh Nebbergall (K), Everleigh Barry (2), Principal Mrs. Godby, Brayden Quarles (3), Jackson West (3) and RJ Diskete (3); (third row, l-r) Kamdyn Hooley (2), Jacob DeHaas (2), Bli Kretchek (3), Katelyn Tyree (4), Ashton Fenner (4) and Ryan McClain (4); (fourth row, l-r) Kaela Hatch (5), Aiyanna Skinner (4), Liberty Moore (5), Arianna Huguely (5) and Lillie Schrimper. Notr pictured is Victoria Mohr (PK).